I spotted a new collection of makeup by essence today, called A New League. The collection is completely untouched, and the display is full so I think the items just arrived! Swatches after the jump. There are 4 nail polishes- blue, red, green and brown. All very vibrant shades. At the back, you can see 2 eyeliner shades in brown and black. The multi-color bronzing powder and blue nail polish. Hair ties and brown nail polish above. There's also a compact mirror/comb in blue as shown in the first picture. There are 3 cream shadows and a lip tint. The swatches in the next pic show the colors are pretty vibrant and wearable. 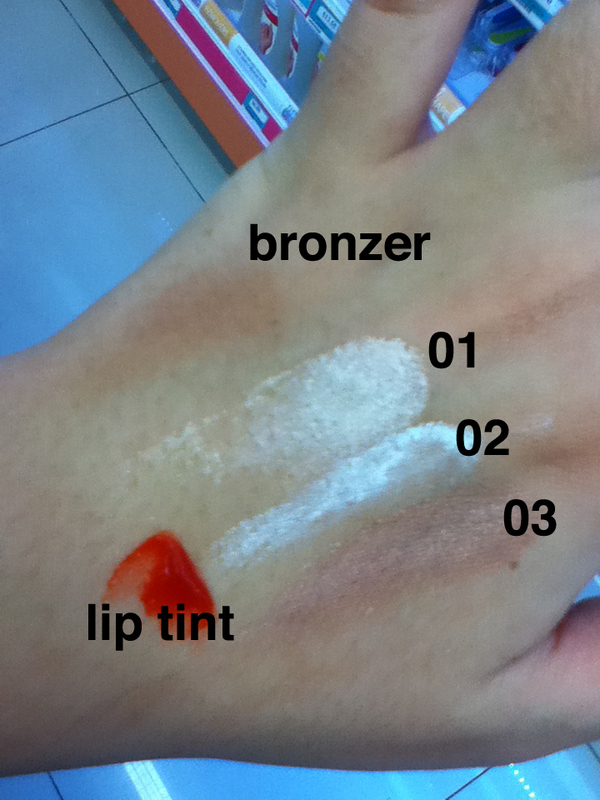 01 is a rosy champagne tone, 02 is a white glittery tone while 03 is a coppery color. 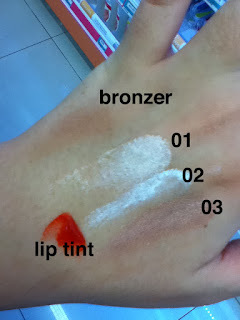 The bronzer has some faint shimmers in it (not captured), and the different colors mix into a really versatile bronzer. Pretty good for contouring. The white shade is a nice highlighter. The lip tint is pretty bright and has an orange tinge to it. I contemplated for some time but eventually didn't get it as I have something similar in my makeup stash. I didn't get any of the items from this collection as I have cream shadows in very similar colors. The nail colors are too bright for me. The color payoff of the makeup items is pretty great so it's a pretty nice collection. Always love the price and quality of essence cosmetics!